One email every few weeks. 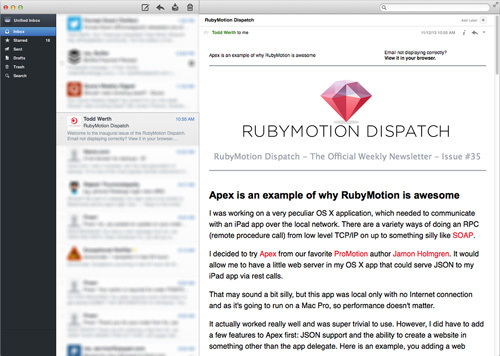 All about RubyMotion: recent news, tips & tricks, new gems, app of the week, etc. My name is Todd Werth, I’m the editor of the Dispatch, co-founder of InfiniteRed, and the creator of RMQ. You can reach me here: todd@InfiniteRed.com, @twerth, or http://InfiniteRed.com. You can unsubscribe easily. No spam, I promise. Still worried? Call me (415) 295-6152.